Want to find the perfect camera to help you capture the best ever high-quality selfie? 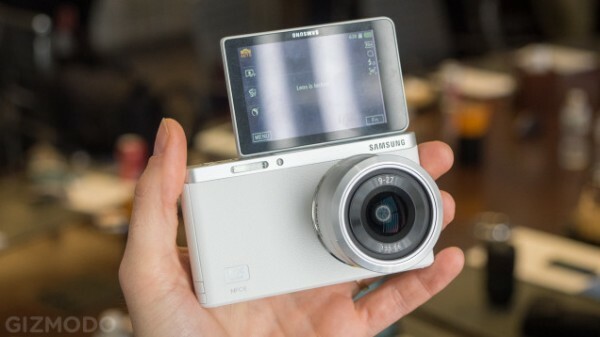 Samsung has just announced the brand new NX mini, the world’s thinnest and lightest interchangeable lens camera with a screen that you can flip 180-degrees, perfect for capturing selfies. First up, the NX mini is very similar to the Sony RX100 Mark II that we all love, with a 1” 20.5MP BSI CMOS sensor on board. The biggest difference between the two would be that the NX mini allows you to switch the lens while the RX100 Mark II has a fixed zoom lens. Other specs include Wi-Fi, NFC, a 1/166,000 max shutter speed, ISO up to 25,600, 6fps burst shot, 1080/30p video and a battery that can last up to 650 shots in a single charge. Software wise, the NX mini will come with the usual Samsung features like AutoShare, AutoBackup, Mobile Link, Samsung Link, Group Share, Photo Beam and a Baby Monitor. The NX mini is available in an array of very attractive colors – black, white, brown, pink and mint green, perfect for the fashion-conscious individuals who are always on the go. Samsung also announced three lenses for the NX mini – a wide-angle 9mm f/3.5 lens, an optically stabilized 9-27mm f/3.5-5.6 zoom lens, and an upcoming 17mm f/1.8 lens that will be released in the upcoming months. The NX mini can also be paired with existing NX lenses using a $150 adaptor. The NX mini retails for USD$450 with kit-lens on board, that’s approximately RM1,500.